Sporadic downpours, interspersed with periods of bright sunshine don't allow me to plan an itinerary. I dash off to the various tourist spots of the city as and when the weather permits. My two days in Jaipur are spent touring the forts of Amber, Jaigarh and Nahargarh, the recently restored temple complex of Kanak Vrindavan, the city palace museum, the Jantar Mantar Observatory, Jaipur's signature building -- the Hawa Mahal (Palace of the Winds) and the grand Rambagh Palace. Whew! There was so much to see... and only brief spells of sunshine. 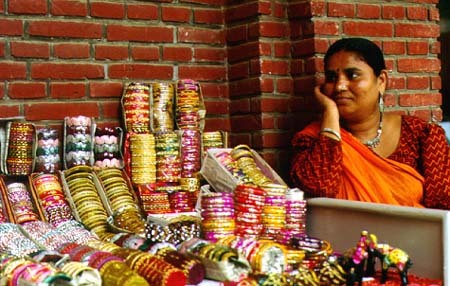 Jaipur is also a major hub for Rajasthani handicrafts and a trip to nearby Sanganer is obligatory. In fact, Sanganer is famous throughout the country for its handmade paper and block printed fabrics. Jaipur also offers blue pottery, enamelled jewellery, lac and glass bangles, colourful tye and dye fabric and the special, feather weight Jaipur quilts. I embark on the third leg of my journey. Enroute from Jaipur to Kota, I notice a dramatic change in the countryside; I have entered the greener and more fertile belt of central and southern Rajasthan. Out of the tinted windows of the cab, I look out on stretches of wheat and corn fields, while the cabwallah cheerfully whistles songs of yesteryear Indian films. A thunder storm engulfs us as we approach Tonk, a former Muslim kingdom whose only remnant of glory is the Sunheri Kothi (or gilded bungalow). A splendid edifice with polished floors, stained glass windows, mirror panels and stucco and gilt-embellishment combine to give it the look of a Venetian jewel box. But this gilded mansion is in desperate need of repairs... otherwise it will soon crumble to dust. Just a few kilometres off the main Jaipur-Tonk-Kota highway lies the small hamlet of Uniara, famous for the gigantic, larger-than-life stone elephant carved out of a single rock. 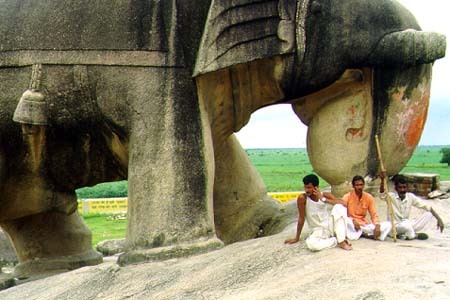 Known as Khera Hathi Bhata or village of the stone elephant, it is a popular monsoon picnic spot for nearby villagers. By the time I spot the twinkling lights of the power station at Kota across the river Chambal, it is already late evening. I immediately head for the Umed Bhawan Palace, my headquarters for the last two days of my monsoon sojourn. Next morning, I familiarise myself with the Umed Bhawan Palace. Formerly the residence of the former Maharaos of Kota it is today a splendid heritage hotel. Designed by Sir Swinton Jacob, it is a unique synthesis of the traditional and the modern. Constructed by Maharao Umaid Singh, it remained the royal residence till the present Maharao, Brijraj Singh, decided to convert it into a luxury hotel. The Maharao now resides at Brijraj Bhawan, the picturesque riverside, colonial-style palace overlooking the Chambal river. However, his mother, the Rajmata of Kota, continues to stay in one section of Umed Bhawan. Hailing from the royal family of Bikaner, the octogenarian Rajmata, Shiv Kumari, is the daughter of the illustrious Maharaja of Bikaner, the late Sir Ganga Singh. 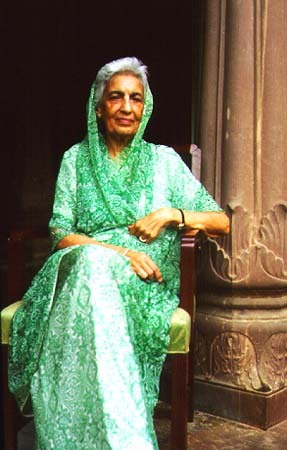 In fact, her marriage to the late Maharao of Kota, Bhim Singh, in 1930, coincided with the completion of the Umaid Bhawan. The Rajmata graciously agreed to meet me over a cup of tea in the well-appointed, private sitting room in her section of the palace. Elegantly draped in an emerald green, printed French chiffon sari, she talks of how she came here as a new bride and how, in her subsequent years as Maharani, she played the role of official hostess. Kota may not have gained prominence as a tourist destination, but its importance lies in the fact that it is Rajasthan's largest industrial city. 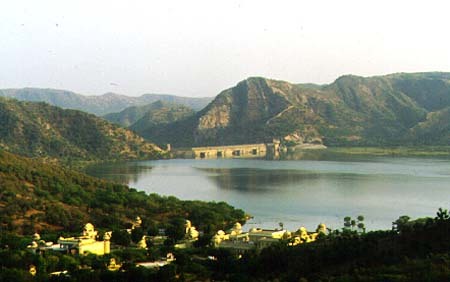 Now, along with Bundi and Jhalawar, it is fast emerging as a new tourist spot. A torrential downpour begins, as I now make my way towards Bundi, founded by the Hara branch of the Chauhan Rajputs in the 14th century. It is a convenient day trip from Kota. 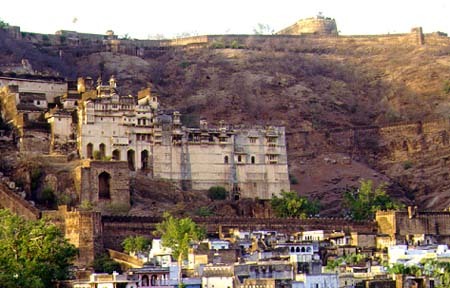 Bundi, which is rather medieval in character, is famous for its awesome fort atop a 550 feet hill. The historian, Colonel Todd, rated it as one of the finest in all Rajputana. By the time I return to Kota, the numerous rivers and rivulets en route are in full spate owing to the heavy rains. Between Bundi and Kota, I have to cross at least three bridges with dangerously high, water levels; I nickname them 'the bridges of Kota country'. While at Kota, I visit the Rao Madho Singh museum in the Kota city palace. It houses a rich collection of miniature paintings from the Kota School of Art, besides proving to be a veritable treasure house of artistic items used by the rulers of Kota. 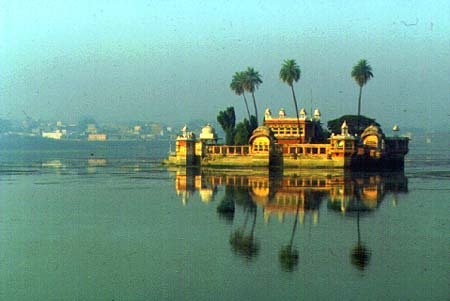 Interesting too was the 18th century Jag Mandir palace built smack in the middle of Lake Kishore Sagar for a princess of Mewar who was married to a Kota prince and who began to pine for the lake dotted environs of her native city of Udaipur. In the neighbourhood of Kota there were plenty of rather interesting places to see. I diligently covered each of them -- the ninth century temple complex at Baroli, the rock paintings at Alaniya, the Darrah wildlife sanctuary, the imposing riverside fort of Bhensrordgarh and the village of Kethun where the famous Kota sari. Kota is also known for its grand and colourful Dusshera fair, an annual fixture held in the months of October or November. My monsoon sojourn through Rajasthan ended at Kota. The next morning I was due to leave for Delhi... and return to my humdrum everyday existence. Before I left I had a chance to visit the waterfalls at Gaibbarnath near Kota. Spectacular! 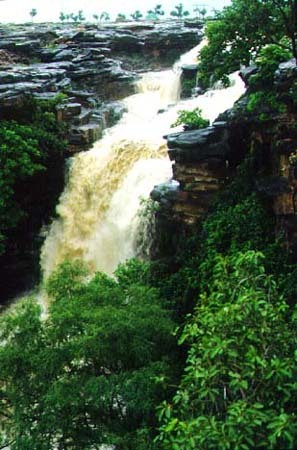 If you happen to visit Kota during the monsoon, make sure you do not miss these beautiful waterfalls which can be seen along the gorges and ravines of the river Chambal. It was a great finale to my monsoon trip. By road Bikaner is 460 kms from New Delhi 460 kms and the route is via Pilani, Churu, and Ratangarh. Jodhpur is the nearest airport but Jodhpur 240 kms away from Bikaner. Bikaner is well connected by rail with Delhi, Jaipur, and Jodhpur. The Bikaner Mail departs from Delhi's Serai Rohilla Station 2140 hours. It arrives in Bikaner at 0830 hours. The fare for a second class AC sleeper is Rs 600. I stayed at the Welcomgroup's Lalgarh Palace, Bikaner, tel # 0151-334001-523963. The tariff for a single room is Rs 2,975 per night. The tariff for a double room is Rs 4,725 per night. The same tariff is will be charged to foreign passport holders in US Dollars at the current coversion rate. Other options are the Hotel Bhanwar Niwas, Rampuria Street, tel # 0151-71043, fax # 0151-61880, where the tariff for a single room is Rs 1175 per night and for a double room is Rs 2350. Or Hotel Karni Bhawan, at the Chowk, tel # 0151-522408, fax # 0151-524144, where the tariff for a double room is approximately Rs 4000 per night but some off season discounts are perhaps possible. Dholamaru Tourist Hotel, Puran Singh Circle, tel # 0151-28621, where the tariff for a double room is approximately Rs 750 per night. Taxis and autorickshaws are readily available. Jaipur is 300 kms away from Bikaner by road. The taxi fare works out to approximately Rs 2000 and the journey takes six hours approximately. It is an overnight journey to Jaipur by rail from Bikaner. The Bikaner Express departs at 2020 hours and arrives in Jaipur at 0700 hours. The fare for a second class AC sleeper is Rs 500. I stayed at the Welcomgroup Rajputana Palace, Palace Road, tel # 0141-360011, fax # 0141-3678848. The tariff for a single room Rs 3,800 per night. The tariff for a double room is Rs 4,100 per night. The tariff for a single room at the US Dollar rate is US $ 135 per night. The tariff for a double room is US $ 150 per night. Other good options are the Taj group's Rambagh Palace Hotel, Bhawani Singh Road, tel # 0141-381919. Or the Taj group's Jai Mahal Palace, Jacob Road, Civil Lines, tel # 0141-371616, fax # 0141-3665237. Or the Rajasthan Tourism run Gangaur Tourist Bungalow, MI Road, tel # 0141-371641, where the tariff for a double room per night to will run to approximately Rs 750. It is a day journey to Kota by rail from Jaipur. The Jaipur-Bombay Express departs at 1330 hours and arrives in Kota at 1700 hours. I stayed at Hotel Umed Bhawan Palace, Saint Road, Khelri Phatak, tel # 0744-325262. The tariff for a single room is Rs 1,550 per night. The tariff for a double room is Rs 2,250 per night. The tariff for a single room at the US Dollar rate is US $ 44 per night. The tariff for a double room is US $ 80 per night. Other good options are the Hotel Brijraj Bhawan, Civil Lines, tel # 05662-25203, where the tariff for a double room is approximately Rs 1500 per night. Or Hotel Navrang, Nayapura, tel # 05662-23294 where the tariff for a double room is approximately Rs 550 per night. Delhi is 350 kms away from Kota by road. Dehradun Express departs at 1940 hours and arrives in Delhi at 0800 hours. Frontier Mail departs at 1115 hours and arrives in Delhi at 1915 hours.